Panic in Molyvos: where is the fire? On Sunday morning fat white low clouds sneaked over the north of the island in the direction of Molyvos from Turkey. In no time the medieval village was covered in clouds and many people asked themselves where the flames were. After all, people are still anxious about fires because the arsonist of Molyvos is still around and because of the big fires in Attica, so not surprisingly these days people first think of fire when they see dense clouds rolling in. Sea fog is such a rarity here only a few people are familiar with it as a weather phenomenon. That is why so many people grabbed the phone to ask friends what was happening. A friend of mine, living high up and seeing the wall of clouds approaching from the sea, even thought for a moment that a tsunami was attacking the island. A fresh wind propelled the low clouds across the sea and it reminded me of my past, of being at the crowded beach of Zandvoort (Netherlands) when a sea mist rolled in over the beach, covering us completely in dense fog where nothing could be seen at all and my mother panicked and gathered up all us children and our belongings. A sea fog might spoil a beautiful day at the seaside, but now it was like a woolen veil was uncovering a tip of faraway memories. Lesvos made the news recently when an UN-organization alarmed the media about the distressing situation at the refugee centre Pagani in Mytilini, the capital of the island. The centre has space for about 250 people, but there are more than 800 refugees kept there, including 200 children. Some of the children recently started a protest hunger strike and this is what alerted the media. To relief pressure at Pagani, refugees were transported to other camps elsewhere in the country. Protests from the refugees and human rights organizations followed. Just like with the huge fire in Attica, the government has done little to ameliorate the refugee problem. In Greece applying for asylum is such a slow process a hundred years would not be enough time to interview all the refugees now in Greece. After all the commotion about the hunger strike of the kids in Pagani, another uproar occurred thanks to the Noborder camp in Mytilini. 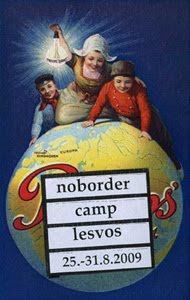 Noborder is an anarchistic-like organization that fights for refugees and they made their camp this summer on Lesvos. They demand better accommodation and faster asylum application processing. Noborder’s final goal is to have all borders disappear in Europe and to let all people travel without documents. I am an old pessimist and do not believe a Europe without borders will ever happen, let alone a whole world without borders. Just like I do not believe anymore in peace for the entire world, even if I really wish it could be true. There will always be people to spoil it for the others, a human being unfortunately is not perfect. Look at the Greek government. The ministers are far from being perfect, they are even negligent. For years Greece has had problems with the refugees, but nothing has really improved. For example, all refugees have to go to Athens by regular transport to apply for asylum. Everybody knows that in August, ferries and flights are overbooked by local and international tourists, so that there is no room for refugees, and therefore they have to wait in the detention centres on the islands, which get very full. Why can’t the government arrange special transport? The Pagani centre owes millions of euros to the companies that provide food for the refugees. That money is supposed to be paid by Athens, but the government is never quick to pay up. The same happened to the firemen who fought so hard the blazes of 2 years ago. I do not agree with everything this Noborder group does, but at least they stand up and do something. While in Molyvos people were gaping at the sea fog, the inhabitants of Mytilini were stupefied seeing scenes in their town just like the riots in Athens last year. Riot police were brought from Athens and on several occasions marched into battle with the activists. The youngsters of Noborder tried to occupy local government offices, they chased the Frontex boat out of the harbour (Frontexf is the EU agency based in Warsaw, created as a specialized and independent body to coordinate operational cooperation between Member States in the field of border security) and they tried to free the refugees detained in the Pagani-centre. The Noborder camp was set up on the 25th of August and was due to end on 31st of August. Hopefully they made people think more about this problem, although the Governor of Lesvos has warned them that their drastic actions could be a negative influence on public attitudes towards refugees. Athens is still so busy sorting out the political consequences of the fires in Attica politicians have barely acknowledged the riots on an island so far away from their beds. Just wanted to say how much I enjoy your blog and hope you will continue to update. I will be visting Molyvos for the first time next week (my partner has visited many times in the past) and your interesting blog has been a useful source of information about Lesvos and the people who live there.